Now that we’re starting to get used to the idea of having a new STAR WARS movie every year, here’s the highly anticipated young Han Solo adventure which fills in the intergalactic space smuggler’s back story. 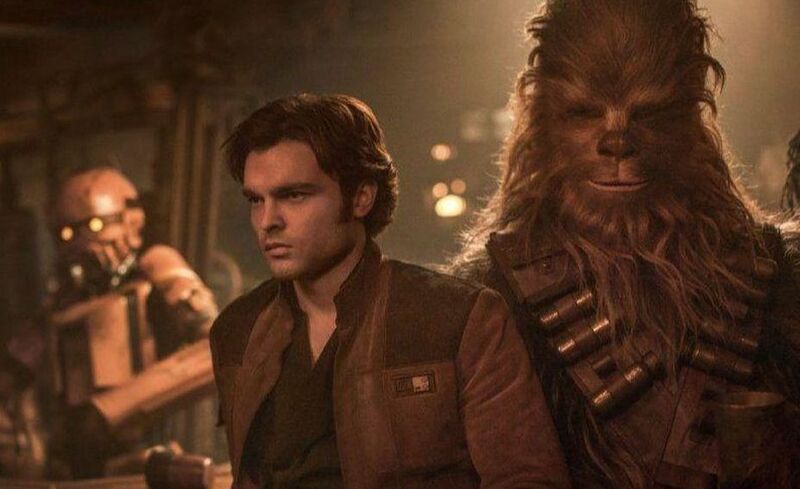 Fans will finally get to see how Han meet Chewbacca (and give him his nickname, Chewie), how he got his treasured blaster, how he won his beloved ship, the Millenium Falcon, from Lando Calrissian; and how the hell he ran the Kessel Run, first mentioned in the original 1977 film *, in under 12 parsecs. But the obvious question is: do fans really need to see how these things happened? Maybe they were best left as asides in movies from 40 years ago? Anyway, Alden Ehrenreich plays the 28-year old Han (we also see how he got his last name, and it’s kind of GODFATHER PART II-ish) who we first meet as a slick street thief in the lawless world of Corellia. Han and his girlfriend Qi’ra (a brunette Emilia Clarke, you know, the blonde who loves dragons from Game of Thrones) scheme to escape the drudgery of Imperial shipyard slums, but they get separated after a lightspeeder chase. Han ends up joining the Empire to become a pilot, but because he’s Han, he gets expelled from the academy, and he meets up with a gruff as usual Woody Harrelson as Tobias Beckett, a criminal scoundrel with a crew who will give Han lessons in how to be a criminal scoundrel. One of the first lessons is, of course, trust no one. Finnish basketball player Joonas Suotamo takes over from Peter Mayhew for Chewbacca whose first encounter with Han I won’t spoil, Westworld’s Thandie Newton plays Beckett’s lover/crime partner, and most importantly, a smooth as ice Donald Glover steps into Billy Dee Williams’ shoes as the iconic Lando, stealing every scene he’s in. With respect to not spoiling plot points, I’ll just say that the premise involves a heist (will all the STAR WARS STORIES be heist flicks?) in which Han and crew set about stealing some of the plutonium-like Coaxium (McGuffin!) from mines on the planet Kessel for the slimy yet dapper crime lord Dryden Voss (Paul Bettany), who appears to have Han’s love, Qi’ra, under his command. All the things you’d expect in a STAR WARS movie are here from tons of blaster fights, scrapes with storm troopers, quipping robots (Lando’s droid, L3-37, played by Phoebe Waller-Bridge fulfills that function), gripping space battles with TIE Fighters, etc. Well, everything, that is, except the Force. For the first time, the Force isn’t part of the story. Nobody has it or speaks of it – I didn’t see any lightsabers – so this may be why Han doesn’t believe in it when we catch up with him in Episode IV. SOLO is a fine sci-fi adventure that keeps moving so there is a fair amount of fun, but it was pretty much what I expected. Ron Howard, who took over from Phil Lord and Chris Miller (THE LEGO MOVIE, the 21 JUMP STREET films), assembles all the elements from the crisply coordinated set-pieces to the marks of the colorful ensemble with his well polished style, but I still would love to see what Lord and Miller would’ve done with it. I was entertained plenty, but I still craved something more. There was nothing that I was surprised by – even a secret cameo in the third act didn’t mean much to me. Aldenreich is good in the title role, but I can’t say I really bought him as being the same character that Harrison Ford made so iconic. That’s probably because I’ve lived with Ford for forty years as the legendary scruffy headed nerfherder. A friend said that Aldenreich doesn’t look like Ford, but he looks like the character. I guess I can go with that, but it’s still hard to not think of Ford. I can go with Glover’s Lando though – maybe he’s the one who should’ve gotten his own movie. So SOLO is a predictable package that’s a passable STAR WARS STORY. The way it leaves room for a sequel is also really expected – i.e. there’s no Jabba the Hut and Greedo here so that could be featured in a follow-up that’ll serve as yet another prequel to the first film. It’s obvious that Lucasfilm is planning on filling every gap in the shared universe of these narratives, so that there will be nothing left to the imagination. Forget the other franchise of the same name, this is the real NEVERENDING STORY. * Click to find out why I’ll never refer to the first STAR WARS as A NEW HOPE.